About two years ago, a friend of mine who works with global spirits colossus Beam Suntory had an odd request — could I come to his hotel the next morning at 9 to try a whiskey? He couldn't give me any details, but he assured me it was of the utmost importance and would be greatly appreciated. I'm not one to turn down whiskey at whatever hour, so I showed up bright and early, looking for the hotel bar. Oh no, I was told, it's in his room. Now, lest you start getting the wrong idea, nothing weird transpired, although my friend's cohort spent much of my visit yelling at the maid to stay out of the room. Whiskey was indeed tasted. I had no clue what it was, and I gave my honest opinion — it was promising, but a little unbalanced. I gave suggestions for how it could be improved, they thanked me profusely, and I was sent on my way. It wasn't until much later I found out I'd been tasting an early iteration of Legent Bourbon (47% ABV, $35), the first expression in liquid form of the five-year-old Beam Suntory merger. When Jim Beam, the legendary Kentucky-based distillery, and Japanese whisky giant Suntory joined forces in 2014, the question wasn't if they'd join forces on an East-meets-West project, but when. It took a few years and a whole lot of frequent flier miles on the part of Beam's master distiller, Fred Noe, and Suntory master blender Shinji Fukuyo, but it's worth the wait. All the kinks that were present when I first tried it have been ironed out, and the result is a bold, distinctive and delicious whiskey. The notion of a blended bourbon was, until pretty recently, anathema to bourbon fans, including Fred Noe himself, who says, "It was kind of a dreaded term in bourbon country. That's where they took grain neutral spirits, a lot of coloring, a lot of flavors, and made what some people would call 'street people whiskey.'" Judging by the bottom-shelf blends of the '70s and '80s, his distaste is well-founded. But American blends have come a long way in the last few years, thanks in part to Fred's son, Freddie Noe, whose ongoing Little Book series of whiskeys (the second one was released last year) is a tremendous showcase for the art of the blend, American style. In Japan, the blender's art is, to a great extent, the focus of the whisky. When the entire world went collectively bonkers for Japanese whisky circa 2014 and bought up all the aged stocks of the major distilleries, it was blenders like Fukuyo who literally saved the industry by creating no-age-statement blends (my personal favorite is Hibiki Harmony) that rivaled the aged stuff. Another, somewhat controversial innovation was the creation of "world whiskies," which, as long as they were blended in Japan, could be called Japanese whisky —even if they were sourced in part from Scotland, Canada, or elsewhere. So blending a Kentucky bourbon, Japanese-style, isn't too much of a stretch. 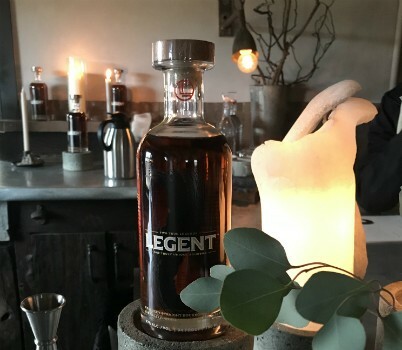 Legent is a division of labor, with Noe distilling the bourbon and Shinji Fukuyo leading the blending, with both of them contributing input and guidance along the way. It's aged at least four years (though I'd guess most of the blend is a little older), and finished in various French wine and Spanish sherry oak casks. The wine influence comes through more readily, with round, fruity notes mingling with the bourbon's natural caramel and spice; the dry, warming finish betrays hints of the sherry influence. The result is bourbon with a Japanese twist more than some strange new hybrid, and as such it can work in any classic bourbon cocktail, or on its own. Best of all, it's only $35 — and it's not a limited edition, either. In fact, it's the first new addition to Beam's bourbon portfolio since the 1990s. So it's priced for drinking, not sticking on a shelf. Noe and Fukuyo are pleased with the final product. "Our accents are a lot different, but we can read each other's eyes, I think," says Noe. "Guys that do whiskey, you can tell when somebody likes it." As Fukuyo puts it, "We communicate through the whiskey." As for me, I have no idea whether, or how much, of a role my comments made on the evolution of the final product, but given how much it's improved, I'll simply say "You're welcome" and leave it at that.